Are you able to ship here at Toronto Canada? I am trying to put my zipcode and it seems that it is only accepting US zipcode. At this time we only ship within the U.S i'm sorry. Does this item packaged just like the photo? Yes, it is. The Travel Themed Vintage Airplane Bottle Opener is individually wrapped in the gift packaging shown on our site with the ribbon and tag. Are the openers also available in silver and is it solid or hollow? 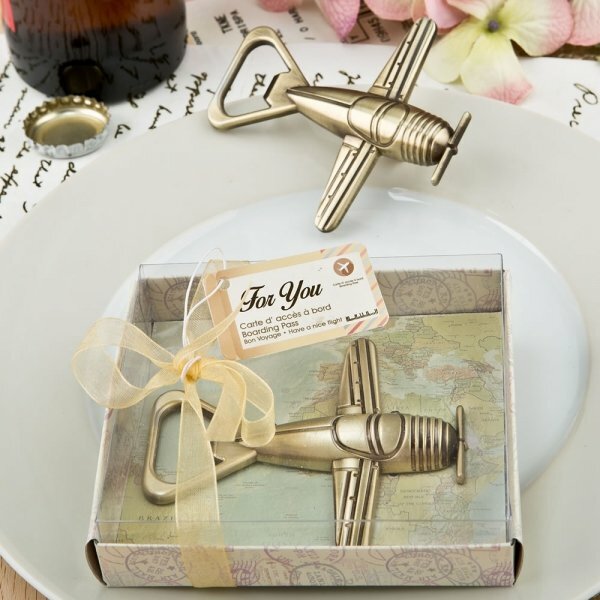 The Travel Themed Vintage Airplane Bottle Opener is solid and only available in brass finish. Hi the travel themed airplane can it say let the adventure begin or is that for the other one? Can the Travel Themed Vintage Airplane Bottle Opener be engraved/ personalized? This item does not offer any personalization options. If you'd like, you can find our personalized tags, stickers, boxes, etc that are sold separately by clicking here. Does the vintage airplane bottle opener come as in the picture? With the box and a "for you" tag? Yes, the Travel Themed Vintage Airplane Bottle Opener is packaged in a travel themed box with a vintage map design as pictured. I want to order 50 of the Travel Themed Vintage Airplane Bottle Opener the price says 16-96 @1.63 is this correct? Yes, the price for 50 favors of the Travel Themed Vintage Airplane Bottle Opener is $1.63 each. The higher the quantity, the cheaper it would be per favor.